I posted a while back trying to make a pattern idea of mine work and I managed to get it into shawl form with all the characteristics I wanted ...except for the edges. Its not my ideal way to make it triangle but this was the only way. What kind of edging could I use to bridge these triangular/ right angle gaps? The starting edge is at the top, right? I notice that you have 3 rows of straight sides and then a long step-in (12? stitches). It would easier plan an edging with smaller jogs, example a jog of 4 stitches over each row, versus 0, 0, 12. Or you could spread small decreases at the edges and have no visible jogs. This might sacrifice running the pattern all the way to the edge, tho. Thank you Granny Square, for replying, this is difficult overall. 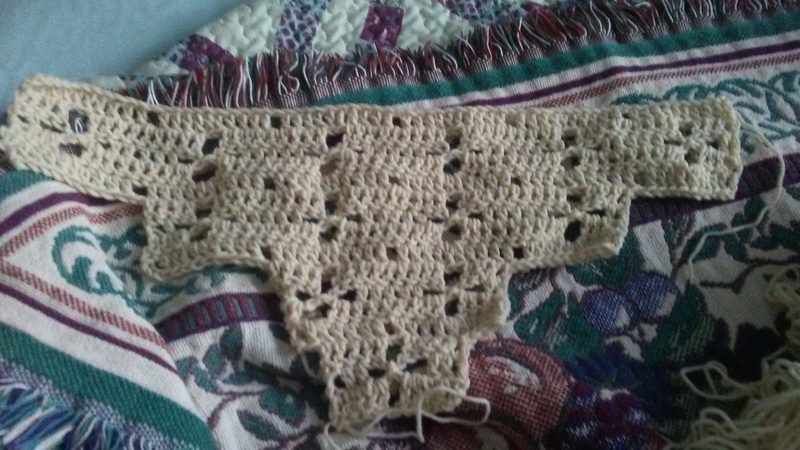 Yes I've done another swatch way larger, about 241 sts on the main chain, and it was originally just going to be a stole in rectangular shape, and I just hated that it couldn't be a triangle shawl, I hated the way it laid, so I came up with this earlier. Unfortunately, if I only did a jog of 4 or 6, it would cut off and then mess up the pattern, seeing as each row of "flowers" are lined up evenly and then the rows in between those, or my "Staggered ch1 spaces" are also lined up evenly, and they wouldn't like up if the jog was any less. If I did do it that way, I'd have extra dc's on each end which would throw it off, and then it would be difficult to know where to continue the pattern on the next row, if that makes sense. Maybe I didn't make sense or maybe I didn't interpret what you said correctly. Sorry if so. this makes sense, i understand what you mean, but this does not have to be the case. If you draw out the pattern, you can keep the flowers and ch1s lined up as you want them, and have any number of plain stitches between them and the edge. I have drawn it out and it never works on paper translated to actually taking to hook and yarn. I guess that's where I'm not good at it/ can't do it. do you have any experience with filet crochet? that is basically how i am envisioning it. try drawing it like a filet chart. Hi again. I know we three (and maybe others) conversed on your earlier thread when you were developing the pattern. I said something like what Magiccrochetfan said above: you may have to ditch the pattern at the edges and just make extra plain stitches to form a straight edge, so you don't have partial flowers right at the edge, and this gives you sort of a border of plain stitches (think of a matte around a picture, before the frame). The problem with the way you've done this is there's not only a 12 stitch jog, there's a 3 row jog. Not only is the gap really wide, it's quite tall and not symmetrical. If the stair-steps were 1 row tall and 3-4 stitches wide I have more ideas than what I suggested earlier that would blend in, but these are just to big to disguise. Not finding fault, because I know it's difficult to design from scratch. Just suggesting that you keep your mind open to not being a slave to the stitch pattern to the bitter edge of each row. Filet is probably what I'd have used to design this for myself, the 'rules' aren't hard, it's all about counting to 3, but some sites trying to teach it are unnecessarily confusing--Hass is one of the best, another is Smart Crochet - link to lessons, lesson 1 would cover your stitches. BUT, your pattern isn't strictly filet, because your 'blips' between the flowers are only 1 stitch wide, where in BASIC filet (open or closed mesh only) the open squares would be 2 wide. There's all sorts of fancy variations. Hi GrannySquare Yes I agree this is not exactly filet. Filet type chart just an easy way to think of it. keep your mind open to not being a slave to the stitch pattern to the bitter edge of each row. So I haven't put in any partial dots or flowers; the ones that I've colored in yellow, I'd probably work as plain stitches instead because they are visually too close to the edge compared to the others (it looks like it happens every third row for the flowers...IMO the yellow flowers NOT being there would look more 'right' to me, the flowers being there look...less elegant) The jog is only 4 stitches each row, which you could more easily span* or fill in with increases as a foundation for an edging. *Span ideas: (1) go around and work a 'ramp' of taller to shorter stitches (DC, HDC, SC, SLST), or the other way around up the other side (2) SLST or SC in the tips and chain across to the next tip, if you don't mind a gap (3) from a tip, chain x, SC into side of same DC, chain x, SC into middle stitch of span, chain x, SC into next tip, etc; x is probably 3 or 4 chains, whatever looks best (4) make a shell stitch into the 'elbow' of the jog, 3 or 4 DC, SLST into tip, repeat. Oh my goodness Granny Square, I LOVE LOVE your chart!!! That is wonderful ! Just the kind of thing I was thinking (but would have to get out the graph paper and a pencil to make). Thanks, glad you like it! I started to grab a yarn and hook to swatch a few rows and then thought, this is dumb...much quicker to do this in Excel, and much less painful to fix a boo-boo! I wish i could cut/paste stitches IRL Also just took seconds to do/undo the grey versus yellow areas to judge how they compare. If you don't have Excel, I think you can do the same thing in Open Office or Office Libre (both free, I have OO on my old laptop and it's like an older version of the Office Programs). I'd already set up a blank spreadsheet with square grids (by eyeballing) and the color coding of every 10 'stitches' in each direction for crochet colorwork and filet (I have another one for knit stitches). Just colored in with paintbrush tool. If you copy and paste a section and are off by a grid, you can grab and move it if you don't click elsewhere first. Nifty! Oh, and since we can only post pic files here, I did a screen shot and pasted into good ol' Paint. You do make it sound easy, but I don't know that my brain cells can handle learning to do all that computer-whiz type stuff!! Well, it probably helps that I spent the last third or so of my working life as a 'business analyst', which sounds complicated but just means knowing how to pull specific data from various areas of our company's system, writing formulas to combine/extract the right stuff, and and making it look spiffy, mostly using Excel. The formatting part is a lot easier than all the above probably sounded, I can walk you thru it if you like . A lot is pretty intuitive, like the paintbrush tool is grab the brush, dip it in a color, and dip it into the cell(s) you want to be that color. Esc key makes it stop painting. Not hard! Hey DQfan937, I think I have a solution that looks a little better. I was fiddling with the spreadsheet and tried increasing the sides by 2, and then by 3. 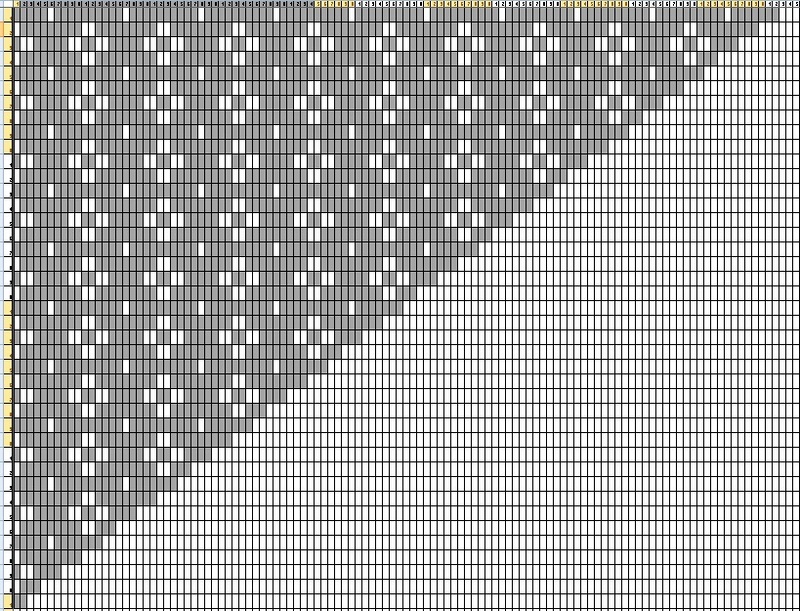 The x2 and indents every few rows like the one above (let me know if you want to see that one), but check out how it looks when you increase by 3 on each side - a nice progression of flower repeats, although the plain rows do increase gradually as you get to the top. Depending on your stitch gauge, you might get away without a 'jog' of flowers by the time you get the width you want. WOW!!! thank you so much for doing this, I can't even imagine, I don't have much experience with graphing anything, just old fashioned counting and taking it to the hook as graphing has never panned out for me or translated well into the yarn version very well. I must say I'm a bit confused ( and I feel so daft sometimes) but are you meaning that I should work from the bottom point of triangle and go up as opposed to working downwards? that's probably a dumb question since we're talking about adding 3 each row. What do you mean you'd work it in the middle? And if I added those stitches at the beginning of every row, and added at the end of each in the chain, wouldn't putting 3 into the chain make it a bit askew or is that just my thinking? I'm sure you're surprised with some of the questions I'm asking that I even got something looking right on the hook. You're welcome, it became a bit of a challenge to solve the puzzle once I saw I was getting close to getting a straight edge! I've only made a couple of shawls, but have looked at a lot of patterns, and just have the impression that shawls worked across like this are generally made from the tip up. It's practical, in that if you run out of yarn, or decide you want it bigger or smaller, you just stop or keep going where you want. If you start at the long edge, you can't change your mind. Believe me, you can get a bunch of stitches into 1 stitch; I know I recently made a shell pattern with 9 in 1 stitch, I think I've made bigger shells as well. Remember, 1 stitch into 1 stitch is not an increase, so if you need to increase 3, you'd put 4 stitches into 1; to increase 2 stitches, you'd put 3 stitches into 1. 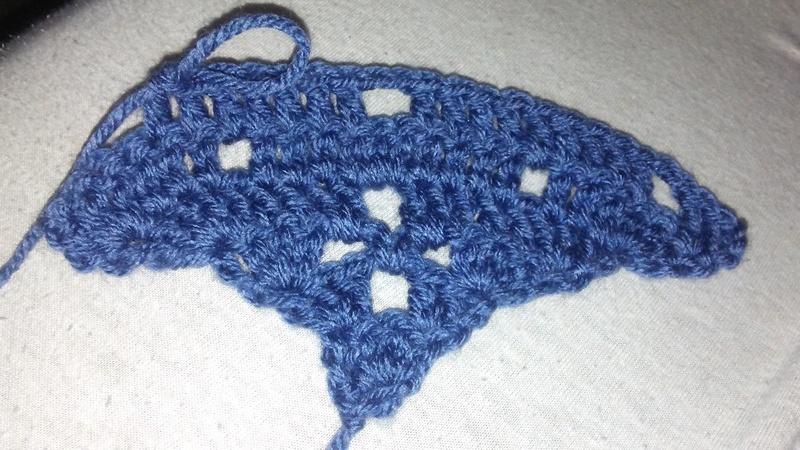 It will look like half a shell stitch, more or less I guess--it will slant a bit, but I think it would look more decorative than askew (shell stitches slant, right?). What I meant about the middle is I've only graphed half of it as you can see, from the center line out. So, example the first row (the tip), I've only graphed 2 stitches but there are really 4 for the shawl tip. So you'd read the chart right to left, and then when you run out of stitches at the center of the shawl (left edge of the graph), you start reading that same line from left to right. Let me know if this half-chart is too confusing to follow - I can add the other side if you need me to, is just a few copy/pastes and tweaking the edges a little. Yeah, if you don't mind giving the other side, it would be a lot easier to figure out. I'm still trying to figure out how to execute it but now I know more of what you mean and I'm going to get hook to yarn now. Thank you endlessly for making that, I didn't know how and you're so precise. I can't thank you enough for your time and help!! Is this what its supposed to be looking like? I've worked it just as the chart with the increases you said. Working out just fine except the angles are wonky a little. What do you think? That with throw your pattern off (increasing between flowers). Maybe try, instead of all the increases at the end stitch, half of the increases in the end and the other half in the stitch inside (toward the center) of the end. It also might stop looking so curved once you get to the point where it's wider, maybe just the end inch or 2 will curl a bit. I've just started a swatch, and I'm finding my advice above doesn't work for the first 3 rows (not enough stitches to start with), and another later one so far. Where I can I'm also spreading the increases over the end stitch and also the 1 or 2 before that - depends on the row. We'll see what happens (can't hurt). 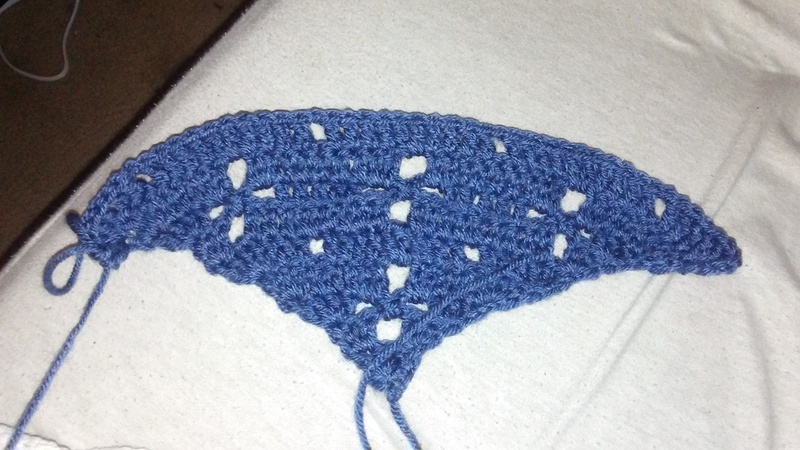 But, I'm only increasing in the solid areas at the ends, so I don't mess up the flower pattern.